Contact Mug directly to schedule your next Yoga for Golfers session! Do you struggle taking your game from the practice range to the course? Mug uses a coaching approach to whole game improvement and believes that instruction on the course is integral to becoming a better player. Emerald Isle’s grass range and easy access to the course provide an excellent learning environment for any golfer, and Mug makes full use of it all in her teaching. Most of all, rather than “fix you,” Mug is here to work with you and get you practicing well so you can take your game to the course and be successful! 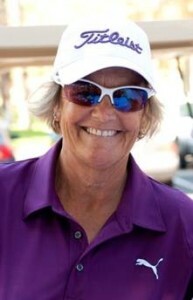 Mug teaches all levels of golfers, and especially enjoys working with beginners, seniors, and women. Nothing makes her happier than seeing beginners hit those first great shots that bring about smiles brimming with excitement and surprise. Mug believes that all you need to play golf is a desire to learn and a belief that anything is possible. Play better, Play longer, Play stronger: “To create power and speed in your golf wing, you need flexibility, strength and balance, all which you get from yoga.” Katherine Roberts, founder, Yoga for Golfers. For private individual or group instruction, contact Mug directly here mug.lpga@gmail.com or call (760) 207-3866. Mug Ogg has taught golf professionally for the last 25 years. She is a Class A Member of the LPGA and was the 2013 LPGA Western Section Professional of the Year. Series of 6 (45 min) Lesson: $300 Best Value!